Los Angeles remembers its Red Cars with an almost mythic reverence. Replicas of the Pacific Electric Railway’s red-liveried trolleys now transport tourists through a Disney theme park, while Angelenos swap wistful stories about the streetcar that would take you to the beach, deep into the Inland Empire, or all the way down to Orange County. Often overlooked are the true workhorses of the city’s bygone transit network: the Yellow Cars of the Los Angeles Railway. As opposed to the interurban Pacific Electric, the Los Angeles Railway provided quick, local service in downtown L.A. and nearby communities. 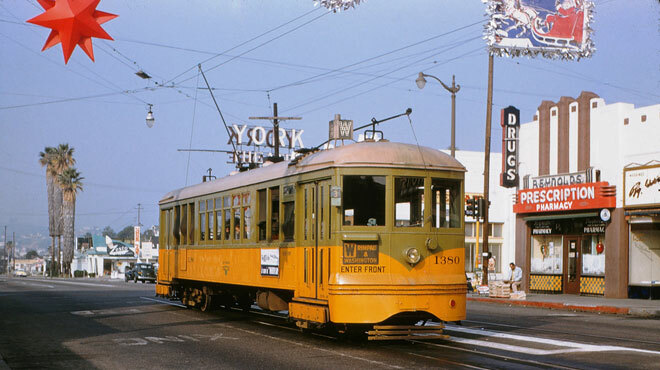 For decades, the Yellow Cars’ bells rang as far west as La Brea Avenue and as far north as Eagle Rock, and the trolleys serviced neighborhoods from East Los Angeles to Hawthorne. Though their reach was shorter than that of the fabled Red Cars, the Yellow Cars carried roughly twice as many riders—at its peak in 1924, the Los Angeles Railway served 255.6 million passengers, and the Pacific Electric only 100.9 million. But by the time Alan Weeks stood on a Highland Park street corner in 1954 and took the above photograph, rubber tires had begun to replace steel wheels as transportation authorities substituted bus routes for one streetcar line after another. The demise of L.A.’s street railways has inspired countless conspiracy theories, many of which spin suspicious-sounding business arrangements into plausible narratives of sinister plots. In Who Framed Roger Rabbit, Judge Doom’s Cloverleaf Industries buys L.A.’s streetcars only to shut them down and build freeways in their place. In other, less fictionalized accounts, automobile manufacturers and petroleum producers play the villains. Most historians agree, however, that more prosaic factors are actually to blame: aging rail infrastructure and frequent delays only hastened the downfall of a transit mode that ordinary Angelenos had rejected in favor of the private automobile. Whatever the reason, on March 31, 1963, the local streetcars—by then painted aqua blue and operated by the publicly owned Los Angeles Metropolitan Transportation Authority—rolled off L.A.’s downtown streets and into oblivion.